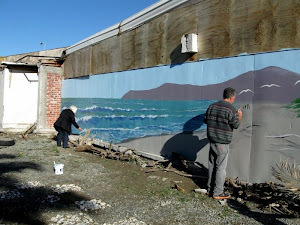 Artist Jim Hobby is currently working with the New Brighton Bowling Club and RSA to decorate the east wall of the bowling green with classic "memorabilia" . They will be celebrating their centenary later this year. Mural Madness was always about beautifying naked spaces in Brighton, and being temporary by nature. Earthquake recovery. As buildings came down, exposed walls were beautified with amazing artworks by talented artists. A second phase has now begun. More buildings are being demolished, taking their artworks with them. Sad, but exciting, as it means progress for Brighton. The good news is that new murals continue to appear, and artists continue to offer their talents. The evolution of Mural Madness continues! Richard 'Popx' Baker is a local Christchurch artists who has contributed to many of the murals in and around Brighton, and Christchurch, and continues to do so. He is often found adding finishing touches to walls that have been collaborated on by many artists. Framing large murals in the form of the word LOVE is a favourite. Popx loves to chat with the local passersby, and is a fantastic role-model for youth. Thanks Popx for all your continued support! Brighton is a beautiful seaside suburb in Christchurch, New Zealand which has been severly hit by the earthquakes that have haunted Christchurch over the last couple of years. Many buildings in its main shopping mall are due to come down as they are structurally unsound. As a result, there are many bare walls and vacant lots. Mural Madness was launched on Saturday 3 November 2012, by Lianne Dalziel, MP. The intention being to beautify Brighton with magnificent murals. Artist from all over the world have participated and contributed, making Brighton an interesting artistic venue. The work continues....... This blog follows the evolution of Mural Madness in Brighton.